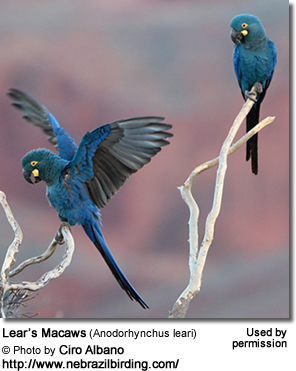 The Lear's or Indigo Macaw (Anodorhynchus leari) is one of the rarest parrots in the world. This Brazilian endemic is found only in a few areas of its original habitat that are currently protected. This species has otherwise disappeared from most of its former range due mainly to trapping for the trade and hunting. It is estimated that less than 1,000 of these birds still exist. Even though this bird was first on exhibition at a Brazilian Zoo in 1950, it was considered to be a hybrid at that time - likely derived from the very similar Hyacinth. However, due to slight differences in the plumage, this idea was eventually abandoned. In 1978, this parrot was officially recognized as its own species after the first wild populations was discovered by ornithologist Helmut Sick during his exhibition in Bahia in the interior northeast of Brazil. 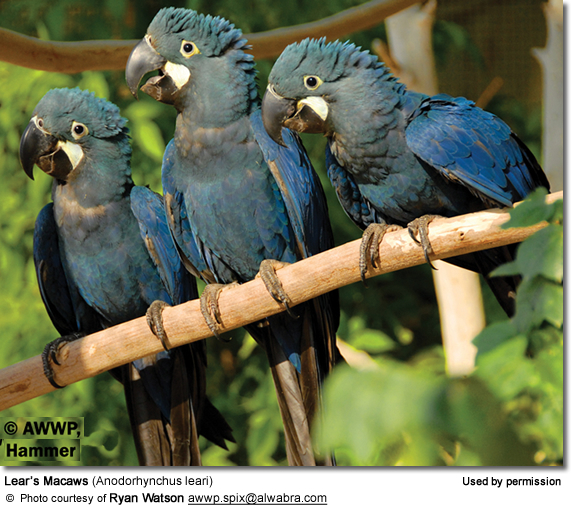 The Lear's Macaws belong to a group that is commonly referred to as the "Blue Macaws, which includes the closely related Glaucous Macaws (Anodorhynchus glaucus), Spix's Macaws (Cyanopsitta spixii) and the Hyacinths (Anodorhynchus. hyacinthinus). All members of this group are either extinct or at risk of becoming extinct. The Lear's Macaw is endemic to Brazil, where it has a limited distribution within the Bahia and adjacent Pernambuco states in north-east Brazil. In 1995, a group of 22 was found between the cities of Sento Sé and Campo Formoso. However, they are now considered to belong to the Toca Velha / Serra Branca population that travelled to take advantage of fruiting licurí Syagrus palms. However, since not all areas within its native range have been thoroughly surveyed, it is possible that other, yet unknown groups of Lear's Macaws, exist. They occur in an open or partially open arid caatinga habitat with thorn-bush vegetation and sandstone cliffs that they use for colonial nesting and roosting; and nearby stands of Licuri palm (Syagrus coronata), the nuts of which they predominantly feed on. Caatinga vegetation includes giant succulents, fachiero cacti, and diverse opuntia types. The Lear's measures between 70 – 81 cm (27.5–32 inches) in length, from top of its head to the tip of its long tail. They weigh between 800 - 1,000 grams (28 - 35 oz) - the average weight being 950 g (~ 34 oz). The eye rings are orange-yellow. The distinctive large rounded featherless patches next to the lower bill are pale yellow. The heavy beak is black; the tongue has a yellow stripe, the legs are dark grey and the irises dark brown. 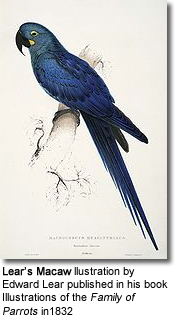 The plumage is mostly cobalt blue; however in good sunlight, their feathers look glossy - particularly those on the wings and back. The head, neck, chest and belly are more greenish-blue. The underside of the tail and wings are blackish. Males and females look alike. The male may have a larger beak and may generally be larger in size, but those differences vary or may just be slight and are not considered reliable for gender identification. Surgical or DNA sexing (blood or feathers) is typically employed. Juveniles can be identified by their shorter tail; the upper bill is paler. The unfeathered skin patch is a paler yellow in immature birds. 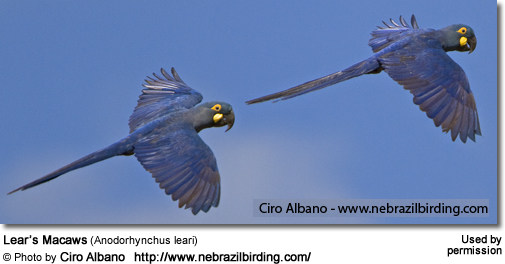 The Hyacinth Macaw: At 70–75 cm (27.5–30 inches) in length, the Lear's Macaw is a smaller version of its cousin, the Hyacinth, which measures about 1 meter or 40 inches in length. The blue color of its plumage is lighter than that of the Hyacinth, the color is less intense and is tinged with green. The patches of yellow skin adjacent to the base of the bill are also larger and more rounded in the Lear's. Another difference is the size and shape of the wings. Lear’s have long slender and pointy wings; the Hyacinths have broader wings. 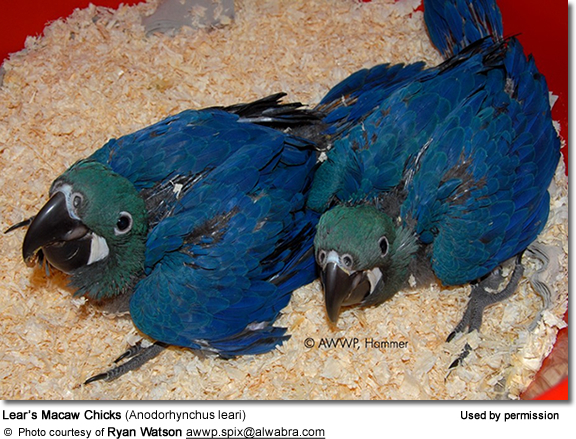 The Glaucous Macaw is very similar; but is slightly smaller in size and the plumage is paler. 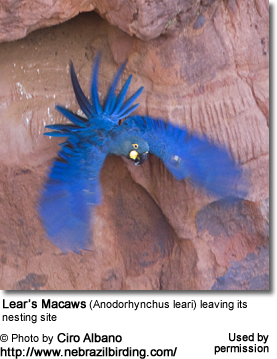 The Glaucous didn't naturally occur in the same areas as the Lear's Macaws either and are also considered extinct. So confusion is unlikely. 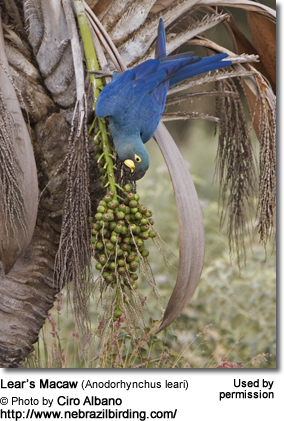 They mainly feed on the nuts of the licurí palm (Syagrus coronata), which make up about 90% of their diet. Each individual may eat up to 350 of these nuts each day; and it is estimated that about 450 fruit-bearing palms are needed to feed one macaw. They use their large, strong beaks to crack open the hard shells, so that they can feed on the white meat inside the nuts. They typically remove a cluster of 10-20 fruits and work their way through the cluster. They may carry a cluster to a nearby tree and eat the fruits there. They have also been observed on pastures, feeding on nuts that had been eaten by cattle and had passed through their digestive tracts, making the nuts softer and easier to open. They also eat the seeds and fruit of numerous other trees and bushes, including Melanoxylon, Pinhão shrub (Jatropha pohliana var. mollissima) , Syagrus coronata palm nuts, Spondias tuberosa (commonly known as Umbu, Imbu, or Brazil plum), as well as Agave flowers, maize, various ripe and unripe fruits, berries and vegetable matter. They are commonly fed Brazil nuts, walnuts, pine and peanuts; various fruits and vegetables (apples, pears, oranges, plums, bananas, cucumbers, half-ripened maize, carrots, rose-hips, rowanberries). They are usually provided a quality parrot seed mix containing sunflower, safflower, hemp and canary grass seeds (also sprouted); as well as wheat, oats, various millets, and greenfood (such as chickweed, dandelion etc.). During the breeding season, they may be fed soaked pigeon food, animal protein with dried shrimp, chicken and chop bones with meat remains on them. When rearing young, bread, eggfood, porridge and biscuit are provided to the parents to feed the young with. A good quality avian vitamin and mineral supplements (especially D and B complex) are also given. They usually occur in groups of 8 to 30 birds; to a lesser extent in pairs or smaller family groups. Their loud calls are very conspicuous and they are mostly observed flying or perching on the outermost branches of trees or palms. Up to 4 individuals typically roost in one hollow and crevice of 30 - 60 m (100 - 200 ft) high sandstone canyons. During the daytime, they rest in shady trees or in licuri palms, where they also feed on palm fruits. On occasion, one can observe them preening each other, croaking from time to time. They are shy and, when alarmed, will fly up calling loudly. They may then circle briefly before landing again on a tree (if they deem it safe to do so), or will fly off. At the beginning of the day, a small advance party of two to three male will "scout out" potential feeding or roosting sites. They will also be the first to return to their roosting areas at sunset. This "sentinel" group will then quietly perch on the tallest tree for about ten minutes. Once satisfied that there is no danger, they will call loudly to the others, who will then follow them either to the feeding or roosting site. If danger has been found, the "scouts" will let out their loud signature calls to warn the rest of the group. To escape predators or poachers, these parrots can reach flight speeds of up to 55 km or 35 miles per hour. Their flight is undulating with deliberate wing beats. Their contact calls are described as "gurgling" and their alarm / sentinel calls as harsh and croaking, but less so than that of the related Hyacinthine. The maximum longevity is 60 years old. However, most live between 30 to 50 years. They reach reproductive maturity when they are about 2 to 4 years old.